This off-season has been flying by, and I imagine I’m not the only one who’s extremely hyped for the 2019 season. So why don’t we talk hitting? Just over two years ago, before the 2017 season, I made this post on Reddit. In it, I argued that the Nationals were slowly shifting their focus towards making contact. We had just seen stealth bullpens, defense, athleticism, speed and a high rate of batter’s contact win the Royals a World Series in 2015, and it seemed apparent that the Nats were trying to emulate that approach. I think it’s safe to say, this is at least somewhat true. Okay, Rizzo did not mention specifically “contact rates” — but his manager, Dave Martinez, hammered that point home later about scoring more runs with runners on third base, and he then pointed directly at Michael Taylor as a four-tool player missing the hit tool and the issues with contact, and he made similar points with Wilmer Difo. Somewhere in the Nationals internal valuations of hitters, they value players who make contact, and don’t strikeout at high rates. Here’s the Nats yearly walk and strikeout rates, starting in 2012, four years before I noticed there might be a trend. This also is when the Nationals first went to the playoffs, so it’s a good marker of when they began to field good teams. I used Fangraphs team leaderboards to obtain this info. Not completely linear, but obviously the team started striking out less in 2016. That makes sense though as I mentioned in 2017. At the time, there was only one year of data, so one blip of a season in 2016 did not mean much. 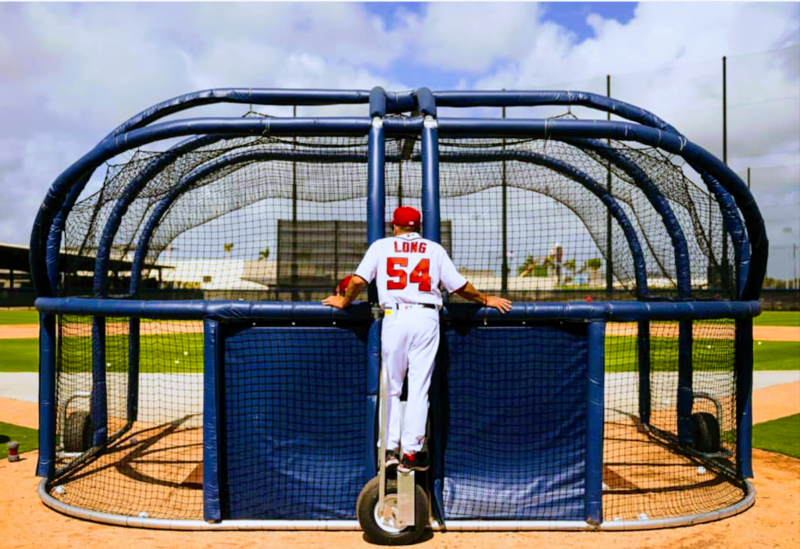 However, that off-season, the players the Nationals acquired, and parted ways with helped reinforce it. We were losing high K% players, and replacing them with low K% players. Go through some of the dearly departed players like Ian Desmond and Danny Espinosa who were gone after 2015 and 2016. They traded a horde of pitching prospects for an outfielder who struck out at a below average rate, made lots of contact, and still took his walks. In 2016, Danny Espinosa struck out 29% of the time in 601 plate appearances. The Nationals traded him off that winter as well (for many other reasons as well obviously). Now, in 2017 it jumped back up a bit, but not to an extreme. It also makes sense again to a degree. I talked a lot about Adam Eaton in 2016, and how his skill-set matched what the Nationals were doing. Well as we know Eaton only played in 23 games that year, and his career K% of 16.6% was replaced by Michael Taylor‘s 31.4%. Only three other players on that team even had a K% above the 21.4% average: Brian Goodwin (24.8%), Jayson Werth (23.9%), Ryan Zimmerman (21.9%). Interestingly, this is also a team that has consistently walked, a lot. In 2017, we were not in the Top-10, but even then the rate that year is right about where it was the past few years. The league rate just increased significantly in that time span. 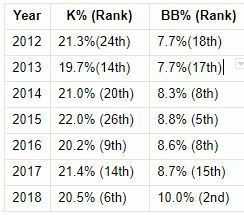 Last years 2nd best walk rate, and 6th best strikeout rate are pretty impressive. With Bryce Harper potentially leaving, that walk rate could take a hit. But overall, the team profiles to take walks, and not strikeout at above average league levels. Here’s another fun little exercise. That’s pretty impressive. Only 2 of the 13 projected opening day position players struck out more than league average (which I have at somewhere around 22.5% for 2018). Walks are only a little different. – Contact % is the percent of total contact, including pitches inside, and outside the zone. – SwStr% is the percent of pitches which are swung at and missed. This one looks very similar to the first chart. In 2014-2015, the Nationals made a little bit less contact with the ball. However, the game has trended away from contact. In 2014, the Nationals 9.4% SwStr% was only the 18th best. In 2018, a worse rate of 9.9% ranked them at 5th. Also, unsurprisingly, there is a correlation between these two metrics. Players who make more contact, are less likely to swing and miss at pitches. Because this trend is continuing into this off-season! While teams are striking out more than ever, the Nationals are quietly trying to go against that. Yan Gomes doesn’t fit this mold, but he also is a defensive catcher. He broke through offensively last year, but his defense is probably his true calling card. Depending on the playing time Taylor gets, Gomes is setting himself up to be the only National that doesn’t really on a higher than average rate of contact. Matt Adams has been right around average in walk and strikeout rates. With Kevin Long’s work with these batter’s and Taylor working specifically this winter on shortening up his swing maybe he will show some great improvement on decreasing strikeouts by percentage and increasing the walk rate. Here is where part of the rationale might be coming from. The idea of walks and getting on base is often seen as one of the defining characteristics of the Sabermetric “revolution”. Good ole, clogging the bases baseball is the key to scoring runs. But it is really just logic, that it is a better outcome to get on-base (or hit a home run) than to make an out. I chose these two players, because they perfectly illustrate what I’m going to talk about. They both had exactly 522 PA in 2018. Unfortunately, Player A had 16 home runs to Mr. B’s 10. So we will keep that in the back of our heads. Now, for those who don’t know BABIP stands for Batting Average on Balls In Play, and you read on TalkNats all the time about the new verb BABIP’d when a bloop falls in after a great pitch. So a players’ total Batting Average (BA) is hits divided by at-bats (H/AB). Batting average on balls in play, is hits divided by at-bats minus home runs divided by at-bats minus home runs minus strikeouts plus sacrifice flies (H – HR)/(AB – HR – K + SF). So, it’s how many times a player got a hit, after making a fielder field the ball. Why is this important? Because to a certain extent, getting a hit is luck or bad luck depending on your point of view. It is not entirely luck as skill is an integral part of the game, but a hitter can’t place the ball exactly where he wants on the field. BABIP, as a result, might be seen as a measurement of luck. We often imagine that players with an extreme BABIP, will move back towards the norm at some point (which has been around .310). Hitters who hit the ball harder and a higher level of line drives, in general tend to have higher BABIP. Faster players, also can often have a higher BABIP due to an increase in infield hits. Even a small number of outs, that turn into hits can be a big difference. 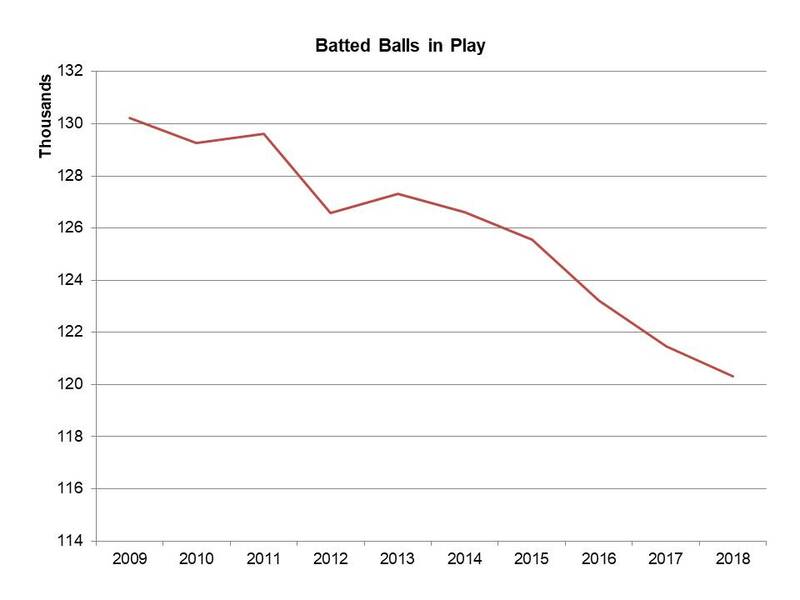 And when a player strikes out a lot, this is only compounded because he is not putting the ball in play and allowing BABIP to work for him. Here’s why, Player A had 522 PA. He struck out in 192 of those PA though. Combine that with his 41 walks and 16 home runs, and he only put the ball in play 267 PA. Almost half of his PA didn’t result in a ball in play. Player A, due to a number of reasons, also had a bad BABIP. All of this culminating, in a horrid .168 average. What about Player B though, what if we gave him the same BABIP as Player A had. Last year, because of his low K rate, Player B put the ball in play 360 times, almost 100 more than Player A. So with the worse BABIP, Player B goes from 104 hits (minus home runs) to 84. Now he has a average of .204. That’s not good, but let’s put it this way. What if Chris Davis (who you might have guessed was player A!) had had a BABIP of .307? That would have given him 97 hits instead of 79, and an average of .206. The point of this wasn’t to show that players who strikeout more are worse. It was to show that they can be more volatile. We often hear that a ball in play is better than a strikeout because it could be a hit. What this really means though, is that every time the player does hit the ball, they have to make it count. For players who cannot hit 35+ home runs a year, this isn’t as big of an issue. But for a player who can’t do that, some bad luck can severely impact their success. Chris Davis “ceiling” in our exercise, basically had him at Tucker Barnhart‘s “floor” (Barnhart was the mysterious Player B). Michael Taylor in 2017, was a serviceable offensive player despite his strikeout problem, because he hit for some power and had a BABIP of .360. This past season though when the strikeouts stayed, but the power faded and the BABIP came down to .320, he couldn’t get enough hits to land in his limited balls in play. A bit to let you digest. This isn’t anything crazy, just an interesting dynamic I’ve noticed in the construction of the team for the past couple of years. 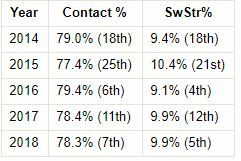 The last segment regarding BABIP is just one reason a reduced strikeout rate as a whole helps. You create more opportunities for something to happen, because with a strikeout, 99.9% of the time, the opportunity is wasted.